Computer, Igniter, CDI, ICM, ECU, and ECM are all names for the black boxes that are the brains behind modern engines. Depending on their type, they control ignition, fuel injection, ABS, display meter or a combination of all. They are very important and often very expensive. Unfortunately they often unnecessarily take the blame for mysterious electrical or running condition problems. 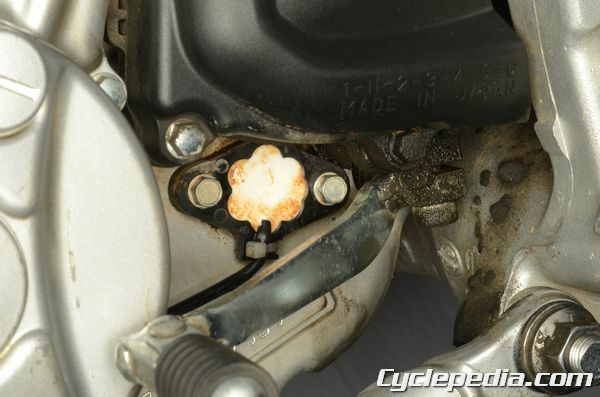 At Cyclepedia.com we provide technical support to motorcycle, scooter and ATV owner’s that have online service manual subscriptions as well as professional service departments or technicians that have our PRO subscription. Periodically we receive phone calls or support tickets from mechanics, shade-tree and professional, that have become frustrated by a vehicle’s puzzling problem and have decided the black box is faulty. They think problem is mysterious, the black box is mysterious, and that must be the cause of the mysterious problem. In most cases there are not diagnostic procedures for black boxes themselves. If you are lucky the manufacture might specify some output voltages or resistance figures. The last line of an ignition troubleshooting chart is often, “Faulty ECM – replace with a known good unit.” That statement is assuming that everything else on the vehicle is functioning correctly, not that there is a damaged wire in the harness you haven’t caught yet. Replacing the black box is a last result option. They are very rarely the cause of the problem. 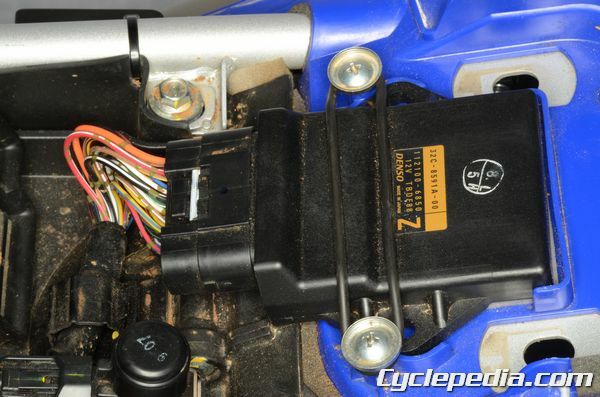 They should only be replaced once all other issues have been ruled out- not just testing the obvious components, but carefully inspecting the wiring harness, connectors, grounds, and switches. Don’t get too fixated on one component or one system. Have an open mind. Take a break and come back to the problem if possible. All too often we hear from folks who have become frustrated and declared they have a faulty box on there hands. Hopefully they sought further advice before wasting a wad of money. The worst case is the person has jumped the gun and bought a new box, and often other electrical components too, just have the same problem. 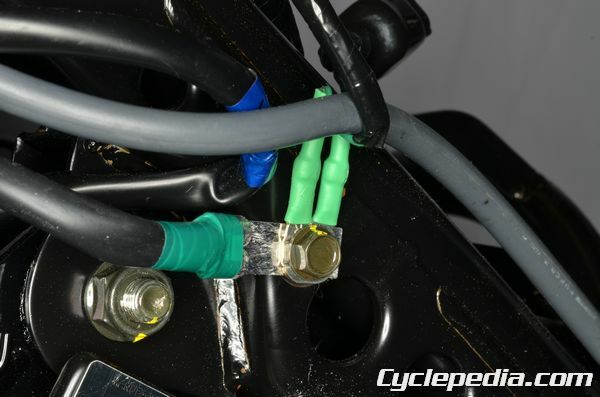 The following is a list of the true faults behind some suspected bad black boxes cyclepedia has helped out with over the years: gear position switch, reverse override switch, engine kill switch, ignition switch, side stand switch, bad ground, wire harness damage, and a fouled spark plug. 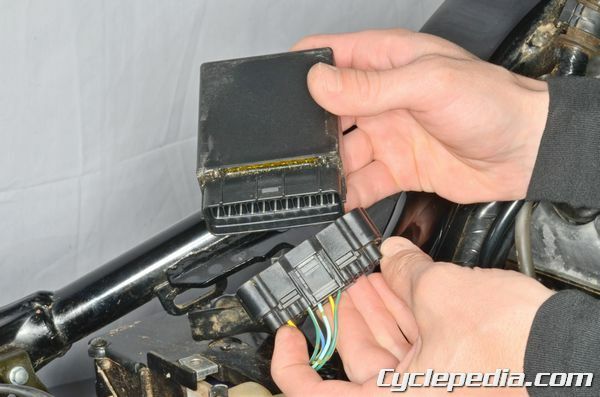 In all the years of working on powersports vehicles the collective staff at Cyclepedia has only encountered two true faulty black boxes. The first was an ignition box that was damaged by being unplugged and plugged back in while powered. Never unplug or plug in this type of component while the circuits are powered. The second was an ECM that emitted smoke and a black liquid that smelled of an electrical fire when the main switch was turned on. Further research showed that this component should have been replaced years ago by an OEM recall.